Since 2000, Domestic Workers United (DWU), a community-based organization of 4000 nannies, housekeepers, and elder caregivers, has organized for power and fair labor standards, building a movement for change. This summer, DWU's efforts culminated in a historic victory: New York became the first state in the nation to pass a Domestic Workers Bill of Rights. In accordance with this new law, the New York State Department of Labor (DOL) is to prepare a report by November 1, 2010 on the feasibility of collective bargaining in the domestic-work industry. As domestic workers are currently excluded from collective-bargaining laws, DWU has begun to study what inclusion would mean and which models of collective bargaining would function best in this industry. Based on DWU's research and as an appropriate next step after the passage of the Bill of Rights, DWU recommends that the New York State Legislature amend Section 701(3) of the State Labor Relations Act (SLRA) by December 31, 2010 to eliminate the exclusion of domestic workers. The DOL and the Legislature should also ensure that the Public Employment Relations Board (PERB), the SLRA's governing body, has the flexibility and authority necessary to determine bargaining structures for this sector. 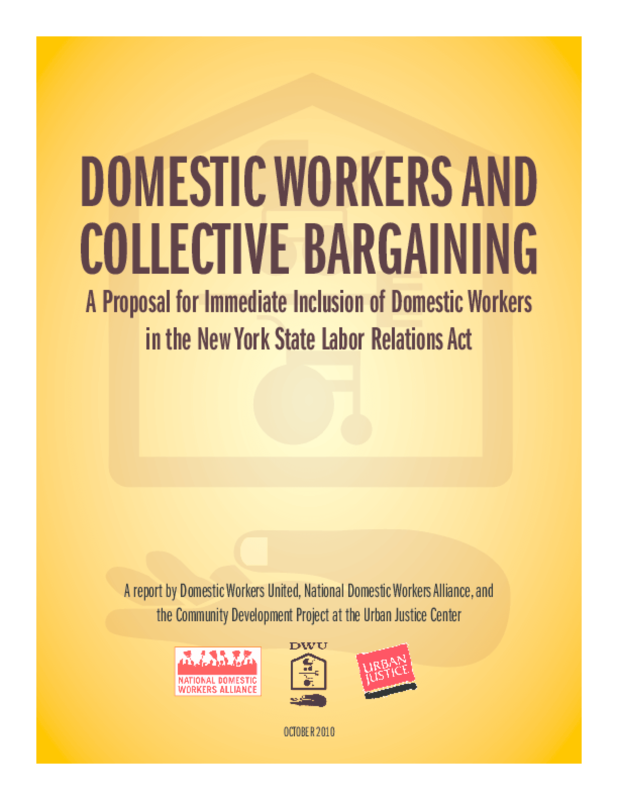 This report documents the inconsistent, informal, and uncertain nature of domestic employment and concludes that domestic workers need the right to collectively bargain. Inclusion under the SLRA would represent more than a symbolic gesture: the law's important protections would allow New York State's domestic workforce to lead the way in exploring collective bargaining. Copyright 2010 Community Development Project at the Urban Justice Center, Domestic Workers United, National Domestic Workers Alliance.